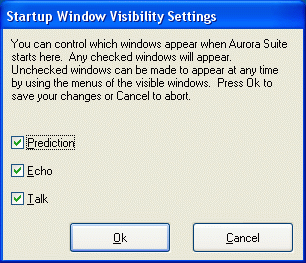 Window Options allows you to specify which Aurora Suite windows open when Aurora Suite starts. After Aurora Suite is running, you can close individual Aurora Suite windows by closing them through their menus or by clicking on their Close buttons. Once all three Aurora Suite windows are closed, Aurora Suite will exit. You can open any Aurora Suite window from the menus of any other Aurora Suite window. Tip: You can close all Aurora Suite windows simultaneously by holding down the Shift key when you close Prediction, Talk or Echo.